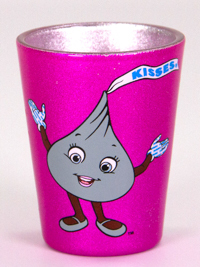 Features the Hershey's Kiss character on a fuschia glitter shot glass. Recommended to handwash with gentle dish soap. Shot glass is NOT dishwasher or microwave safe.